The first week of the September holidays is hit or miss as far as skiing. in Wanaka, this year, it is a hit as the snow is fantastic!. Lots of it and in good condition. Cardrona is always popular with families as it offers great skiing for everybody. It is best for beginners and intermediate skiers. My husband tells me there are places for the advanced skier too. Cardrona takes a punt each year and hopes for late September/October snow and hopes also to encourage some parents away from the crowded July school holidays and out to the next ones. Cardrona, unlike the rest of the ski fields in the area is staying open until the end of the school holidays. 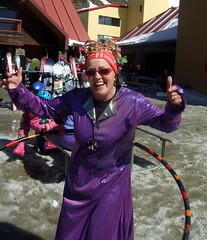 To entice the parents, Cardrona runs the Kids Ski week, although it is a low key affair, a face painter, a few hula hoops and lolly scrambles. What is great though is the lack of crowds, the “warm” weather. Spring is a great time to ski with children as the cold doesn’t have the same bite as it does earlier in the season. We have been at Cardrona for both of the school holidays this year and far prefer the spring conditions. What we have enjoyed is watching is the Junior Nationals which takes place in the first week of the holidays. This looks to be a well attended event. Anybody under 19 can enter and have a try at being in a ski/snowboard racer. So if you are looking for a fun place to get the family skiing, Cardrona is excellent.